Debido al crecimiento de la Red Latinoamericana de Etnomatemática algunos miembros han sugerido la posibilidad de realizar un cambio en nuestro nombre. Hemos elaborado una lista de nombres y te invitamos a participar señalando cuál de ellos te parece más adecuado. Es importante que sepas que tenemos Coordinaciones Regionales en Suramérica, Norteamérica, Centroamérica y el Caribe, Asia, Europa y África. Además 18 coordinadores de países, coordinadores de zona y más de 2200 miembros de más de 45 países. Y este año cumplimos 16 años! 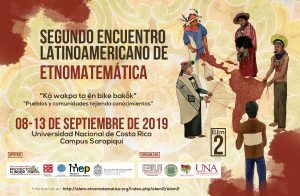 Due to the current growing of the LatinAmerican Network in Ethnomathematics, some members have suggested to change the network´s name. We have created a survey with possible new names and we are inviting you to participate, picking the one that you like most. It is Important to let you know that we have regional branches in South America; NorthAmerica; Central America and the Caribbean Sea; Asia; Europe and Africa. There are 18 country coordinators, subregional coordinators and more than 2200 members in 45 countries. All that in 16 years! The survey will be open until march 15 of 2019, and the selected name will be released in our next congress in Costa Rica. If you want to change your selection, just vote again. we will count only your last choice. We strongly advice to use the email account in which you are receiving this message.